Neufeld, of Great Neck, fought against social injustice on Long Island and elsewhere, her sons said. Muriel Neufeld was a humanist who fought against racial discrimination, capital punishment and gun violence for more than half a century, bringing about social changes on Long Island and elsewhere. In 1959, leaders in Prince Edward County in Virginia closed all public schools in the area so they would not have to integrate, leaving black students with no formal education. While white students attended private school or school in another county, some black students were educated in churches. “Mom coordinated and collected books from all over Long Island, and drove them down to the churches,” said her son Peter Neufeld, a lawyer and co-founder of the Innocence Project, a nonprofit organization that has helped free hundreds of wrongfully convicted men and women. 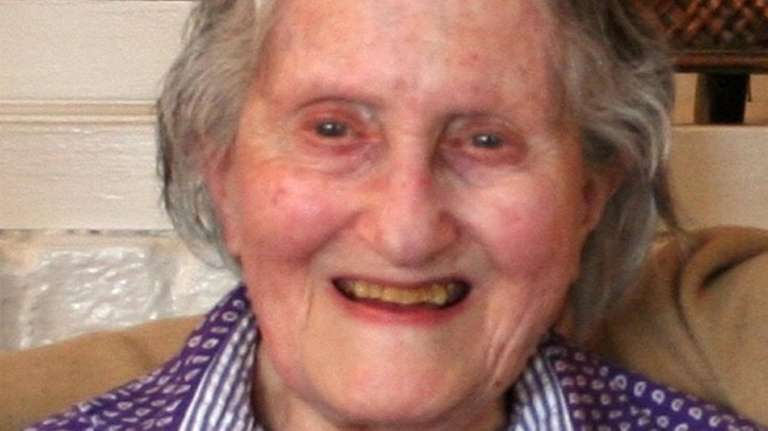 Muriel Neufeld died in her sleep Friday at her home in Great Neck, her family said. She was 98. Peter Neufeld said that when he was 10 years old and his brother, Russell, was 13, their mother took the entire family to an F.W. Woolworth in Hempstead and joined others in picketing the department store chain to protest its policy of refusing to serve Southern blacks at lunch counters. The Neufelds demonstrated in support of four North Carolina college freshmen, known as the Greensboro Four, who went to their local Woolworth’s lunch counter every day, beginning on Feb. 1, 1960, and refused to leave until they were served. “If you believe something is wrong and unfair, don’t just criticize it, do something about it. That’s what she taught us,” said Peter Neufeld, 68, of Brooklyn Heights. Neufeld was born Muriel Newmark on Feb. 9, 1920, in Brooklyn to Ralph and Rose Newmark. She studied sociology at Adelphi College in Garden City, and during this time she met Stanley Neufeld, the man who later became her husband, said her son Russell Neufeld, 71, of Park Slope, a lawyer who specializes in federal death penalty cases. The couple married in 1941 and moved to West Hempstead in 1951 when boys were young. The family moved to Village of Muttontown in 1968, her sons said. Neufeld moved to Great Neck in 1990, a decade after her husband died. Neufeld was vice chair of the Nassau County Chapter of the New York Civil Liberties Union. She founded the Long Island Chapter of New Yorkers Against the Death Penalty and New Yorkers Against Gun Violence. A lifelong member of the Ethical Humanist Society of Long Island, Neufeld, in a 2000 interview, said she shared the group’s principle of dedicating one’s life to the greater good of humanity. “I think religion is your way of life, and through the Ethical Society, I’ve had a wonderful way of life,” she said in the interview. When his mother learned that Nassau Family Court did not have a child care center for children while they and their parents waited for judges, she worked with the staff and started one in the courthouse, said Russell Neufeld. When she realized that families visiting inmates at the Nassau County jail sometimes had to wait in the rain and cold, she got a trailer with a bathroom put at the complex to shield visitors from inclement weather. And, when indigent inmates didn’t have money to post bail pending trial, her sons said their mother co-founded the Long Island Bail Commission, a citizens group that, at the end of 1975, helped about 2,000 people in Nassau gain release. The bail money, they said, came from churches and synagogues, whose leaders agreed to put houses of worship up as collateral. In the event an inmate skipped bail, Neufeld suspected that no judge would seize the properties. Former Assemb. Michelle Schimel (D-Great Neck) said in 1994, when she was a private citizen, she received veiled threats for her opposition to a gun store that wanted to set up shop in the Village of Great Neck Plaza. Gun rights advocates, she said, attacked her position in the local paper. The women, then strangers, formed a friendship that lasted a quarter-century. Schimel, who visited Neufeld regularly over the years, said she last saw her friend about a month ago. “She was still putting things together, ready to fight,” Schimel said. In addition to her sons, Neufeld is survived by a grandson, two granddaughters and two great-grandchildren. Neufeld’s remains were cremated. Services at a later date will be private.